You’ve probably seen or done lots of cool microcontroller projects already, but did you ever consider adding permanent data storage to your projects? I did, and there are numerous advantages: saving data from sensors (data logger), saving configuration files, reading external content like images or songs, and so on! 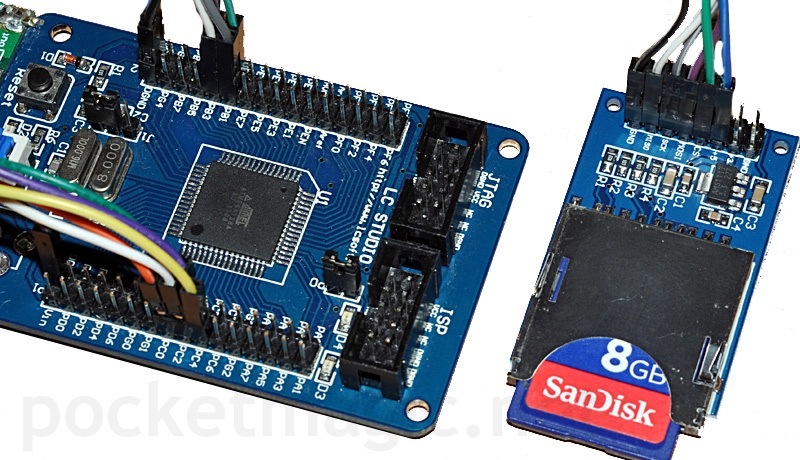 One thing is to connect an SD Card to an AVR microcontroller via SPI (relatively easy), a completely different thing is to be able to manipulate files that are later compatible with your PC (if you take the card from your microcontroller project and connect it to your PC). This is because PC data storage uses a file system, which needs to be implemented in order to achieve compatibility. There are several file systems currently in use, keeping up with constantly evolving hardware: FAT, FAT32, NTFS, EXT, etc. A file system is a way of organizing the data in the entities we are all used with: files, folders, but there is much more than that. One of the simplest file systems, yet compatible with most Operating systems available today is the FAT (older and with reduced capabilities) or the FAT32 (acceptable for the needs of most microcontroller projects). Even so, implementing the FAT32 logic is a considerable effort, taking a lot of time to do from scratch. Here is where FatFS comes to help! FatFs is a generic FAT file system. Intended as a module for small embedded systems, the FatFs is written in compliance with ANSI C and separated from the disk I/O layer completely. This makes it independent of the hardware architecture. It can be incorporated into low cost microcontrollers, such as AVR, 8051, PIC, ARM, Z80, 68k and etc…, without any change. Just perfect for this purpose! I opted using SDCard modules available on Ebay. 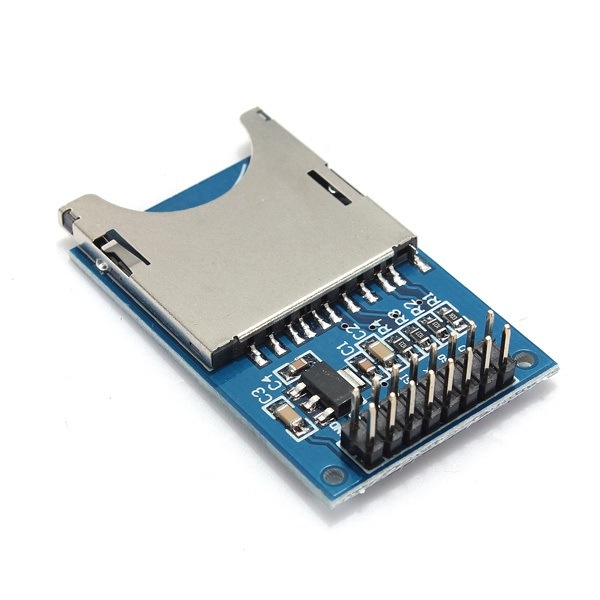 They come with a nice quality SDCard holder, a few resistors and capacitors, a LM1117 3.3V regulator, exposing the relevant data pins for easy connection via SPI to the microcontroller: CS, MOSI, MISO, SCK, VCC and GND. Connecting it to the AVR is simple. Just connect the header pins to the corresponding SPI pins on the microcontroller. You have: MISO, MOSI, SCK. For CS Choose any available IO pin. VCC must be connected to the 3.3V. Let me know in case you need any help doing this. You can also connect an SDCard (or mini/micro sd) to the AVR directly, just match the pins correctly, according to the table in the picture above, and make sure you are using a 3V supply for the Card. The AVR can be connected to 5V (I am using it this way in this example). There are also other macros for disabling the code that you need and save on the output hex size (see _USE_LABEL, etc). My sample mounts the SDCard, and creates a file. Then it appends some additional content. Finally it shows file size, the volume string and the serial number, and tries to read the data from the file and displays it on the 5110 LCD. another time: thanks a lot for your great contribution! As far as I understand, you say that the 5V-powered microcontroller can interface the SD card directly, without using level converter (e.g. voltage divider) circuits between both of them? [As long as the SD card is powered with 3.3V] Or does this only work with the mentioned modules? We used voltage dividers (but not the module) but now the SD card has become unreadable on every PC we tried. 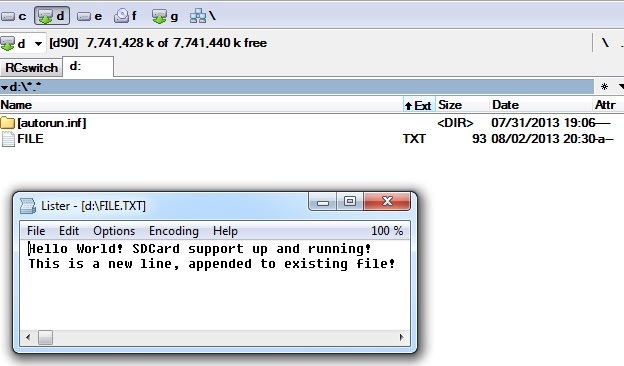 No device is recognized, so no possibility to reformat the card to get back to a plain file system. 1) Assumed that the hardware is built up correctly, is it possible to destroy a SD card just with the wrong software? We are a bit afraid that we will crash other cards too.. Or on the other side, is their a high probability that we have a hardware misconfiguration? 2) Do you know a way to restore a file system on a card that absolutely does not respond to Windows PC card readers or Smartphone Card Slot anymore? katze, if you’ve connected the sdcard to 5V you probably burned its controller, and there is nothing to do to revive it. 1. No, software cannot destroy the hardware in this case. But over-voltage can. 2. I assume you’ve damaged the SDCard physically, so if this is the case , there is no way to repair it. 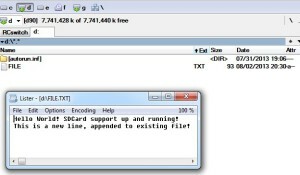 For software defects, re-formatting the SDCard is usually enough. I am curios, what are you working on, given all your previous questions? Hi Radu, thank you for your fast feedback. AFAIK the card was never connected to any voltage higher then 3.3V, but since you state that software alone cannot destroy the hardware, there must be an error in our connections. We’ll check that as soon as possible. To answer your question, a friend of mine builds some smaller µC projects, first the ENC28J60 project(s), now he turned over to a simple temperature logging on SD card. His english is not very good (even worse than mine, that is), so I try to help him as much as i can. It’s a pleasent coincidence to see that your work covers a lot of the small projects we are tinkering with. I am more into Geiger Counters and Scintillation Gammaspectroscopy (as I’ve seen you also did some work with these, another great coincidence) and ATM I try to get or build a smooth negative voltage supply (-1200V) for my Bicron Scintillator (Any ideas about that?^^). 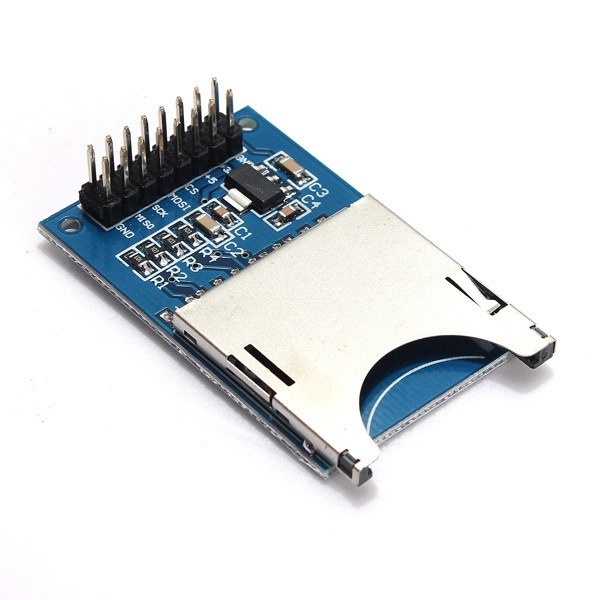 In the future, I’m planning to follow my friends steps and will try to build another radiation detector, this time logging data into the webs using the ENC28J60 module. Hi. 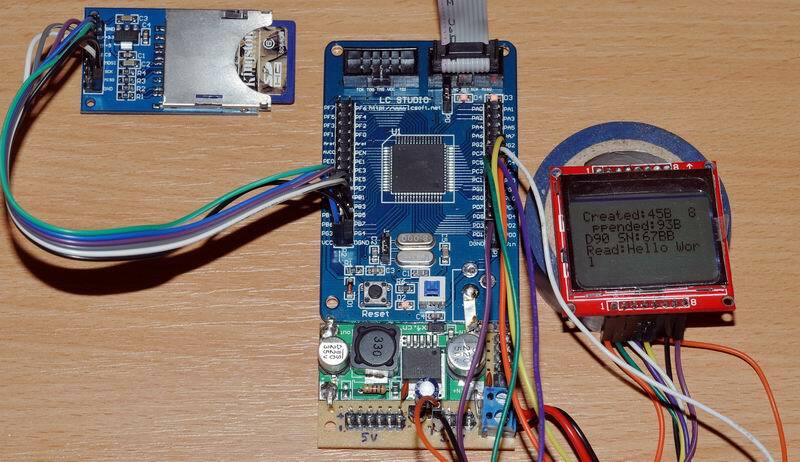 I am logging data in a SD with STM32. I want to write a int with F_write function but it only work with string. Do u have any idea how can i log int on my SD?